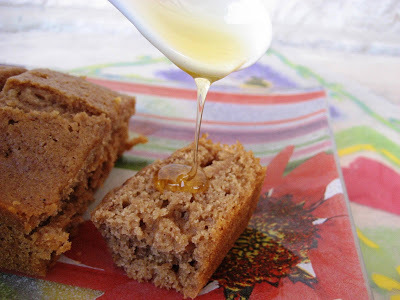 Honey Cake (Refined Sugar Free, Whole Wheat, Low Fat!) - No Way That's Healthy! 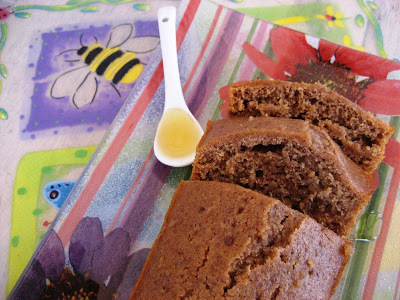 When the Jewish new year comes around one of the most popular things to make is honey cake. The only recipe I’ve ever used and loved is my mother’s recipe. It is just perfect. 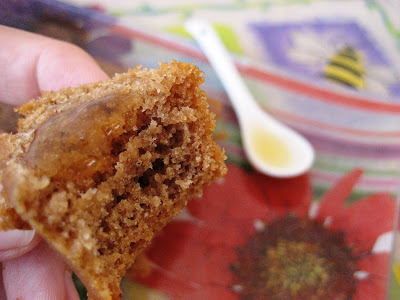 But of course, like many other cake recipes, it has a nice amount of oil and sugar. I’ve even seen recipes with over 1.5 cups of sugar in it. Isn’t this a honey cake? So I figured why not make a cake without all that sugar and use honey as the only thing to sweeten it. The results were too good not to share. Spray 2 small loaf pans with oil. Mix together the first 6 ingredients in order. Then add the rest of the ingredients and mix. I used a large whisk. The batter won’t be very thick, more liquidy. Pour half batter in each pan. Bake for 18-20 minutes. Once the cakes have cooled slightly poke holes in the top with a skewer and brush the tops with extra honey. This cake tastes best as it sits and the flavors come together. I have not tried this with any other oil, but you can definitely try. I used rice milk since that is what I had on hand and it is also naturally sweet. I’m sure you can try another milk, juice or even water. The whole wheat flour I used was 80% whole wheat, which means it is less grainy than regular 100% flour, but it does not have any added white flour to it. I think it may be similar to white whole wheat flour. Again, try 100% whole wheat if you’d like, but the results may vary. Feel free to double this recipe to yield more servings or bake in a different size pan. I hope you give this recipe a try and come back to tell me how you liked it! Do you have any classic recipes you wish were healthy? Let me know below and I will work on it. YUM! This looks great! Can't wait to try it! Especially you eat it with honey,it is so wonderful. Pastrami/turkey bourekas. Wish those didn't have to be in a flaky dough! 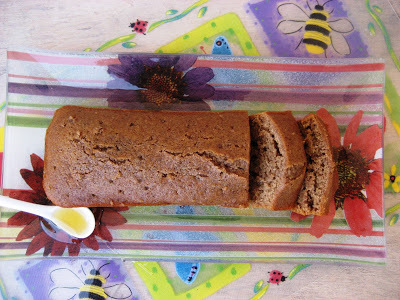 You recipe look relatively easy to follow I hope I can make the cake in the same manner. The picture looks too good to be true. I just want to eat it up. I made this cake this evening, and I can attest to the fact that it is absolutely delicious. It is difficult to believe how a cake so tasty can be so healthy. I love how there is just enough sweetness to make it taste like cake, without it being overbearingly sweet. The honey on the top just completes it. Followed the recipe to a T: it was easy, and the result was perfect. Thanks for the recipe! I just made it too 🙂 Thanks so much for reporting back and I am so so glad you like it!! Making it right now, but with Qunioa Flour and Almond Milk…. Will let you know the results. Does it have to be rice milk – or will almond milk do? I'm wondering if Coconut milk can work here?? Will it give off a strong taste? Sorry I only got to this now. I think that would work great! I was also just thinking that orange juice would work here too.